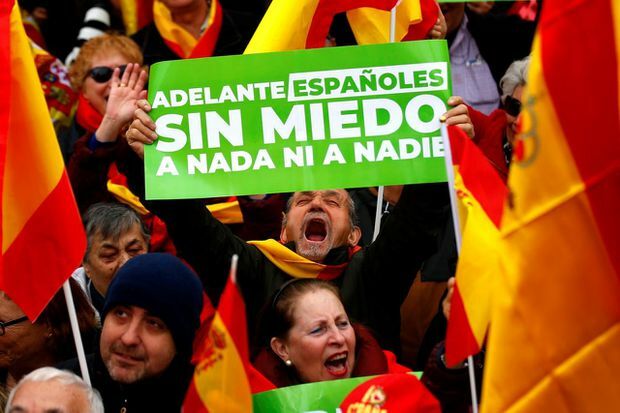 Demonstrators hold banners and Spanish flags during a protest in Madrid, Spain, on Feb.10, 2019. The opposition centre-right and far-right parties called the rally, seeking to make a show of force against Sanchez by capitalizing on anger with Catalonia’s separatist leaders and the government’s efforts to establish a dialogue with them. Recent opinion polls have shown the conservative Popular Party, centre-right Ciudadanos and far-right Vox could together win a majority of seats in parliament if elections were held, allowing them to replace the Socialist government.